Library Helps 'Left-behind' Nepali Women Gain Cash, Confidence - Integration Through Media ....! (VOA): For farmers trying to figure out how to heal a sick cow or grow tomatoes commercially in this Himalayan community, help is at hand in the form of a crumbling, earthquake-scarred library. In a rural area where searching for information online or paying for expert advice is rarely an option, the library is a first stop for female farmers daunted by their new role: running the family farm while their husbands are away looking for work. “Most of the men have migrated for money now in Nepal. It's a very huge problem,” said Meera Marahattha, the “human Google” who runs the library. But there's an upside. “Because of this male migration, females have the opportunity to lead,” she added – sometimes for the first time. Migration is growing around the world among families hit by disasters, conflict or shifting weather patterns. In Nepal – and many other places – women are often left behind in rural areas as men seek work in cities or overseas. Taking on all the work can be exhausting, and being alone is dangerous for some women. But for others, the absence of men can open up opportunities to try out their own ideas, learn new skills and gain confidence. In Nepal, the Tribeni community library in Bhimdhunga is one of 22 that are part of a “Practical Answers” program jointly run by READ Nepal, a literacy and anti-poverty organization, and Practical Action, a British charity. Besides providing resource books, the hubs collect queries from across the community, log them and set about providing tailored answers to farming and other technical challenges. In Bhimdhunga, the library offers a computer suite, a children's nursery and a women's health section, attracting about 200 active members from the mountainous neighborhood. Marahattha, the library head who is a community member herself, often travels house-to-house visiting remote mountain-top farms to field questions and train female farmers. “We have a lot of inquiries,” she told the Thomson Reuters Foundation, proudly flicking through log books filled with neat rows of curling Nepali scrawl. During the planting season, she might receive as many as 1,000 questions a month – but on average it is closer to 500, she said. They range from how to treat crop diseases to how to use a computer or market goods in town. While the library is open to all, Marahattha has found more interest from women – in particular those suddenly put in charge of their households as their husbands or sons migrate abroad in search of work. That change has offered some women a chance to try out their own farming ideas, becoming more confident and boosting their family's finances in the process. But there are “some negatives too”, Marahattha admitted. Women often complain to her of feeling overwhelmed, as if “all the responsibilities are on their head”, looking after both land and children. And the shift in family dynamics, together with the disruption to family life that accompanies migration, has led to a rise in the number of divorces, Marahattha said. Wearing a red shawl draped across her shoulder to match her bright red bindi and lipstick, Urumila Lama, 33, still has a youthful face – though her back bent from toil makes her seem older. She lives with her 11-year-old son on a remote farm on a steep hillside overlooking the lush Kathmandu Valley. But their living quarters are a tin shack, hastily built after a powerful earthquake in 2015 reduced their home, and many others in the area, to rubble. The disaster killed nearly 9,000 people and disrupted the lives of more than 8 million. “After the earthquake, our whole house collapsed. Everything went bad and my husband went to a foreign country to earn,” she told the Thomson Reuters Foundation. But then she heard about the agricultural training being offered by Marahattha at the library and went along. “I immediately took up the practices in my own house and have since been vegetable farming seriously,” said Lama, who has constructed a number of large plastic-covered tunnels and makeshift greenhouses to boost her vegetable production. “I realized we can have a good income from this,” she said. Initially, she earned about $60 a month from growing vegetables such as sweet peppers and tomatoes. Today she makes triple that amount, and can pay for her son's school fees and the family's daily expenses without having to ask her husband for money. “I was here alone. It was not my husband's decision but my own to construct the greenhouses and start doing vegetable farming,” she said proudly. “When my husband came back to visit he was surprised at what I was doing and how I'd gained knowledge,” she said. He urged her to “build a bigger greenhouse and grow more!”, she recalled. 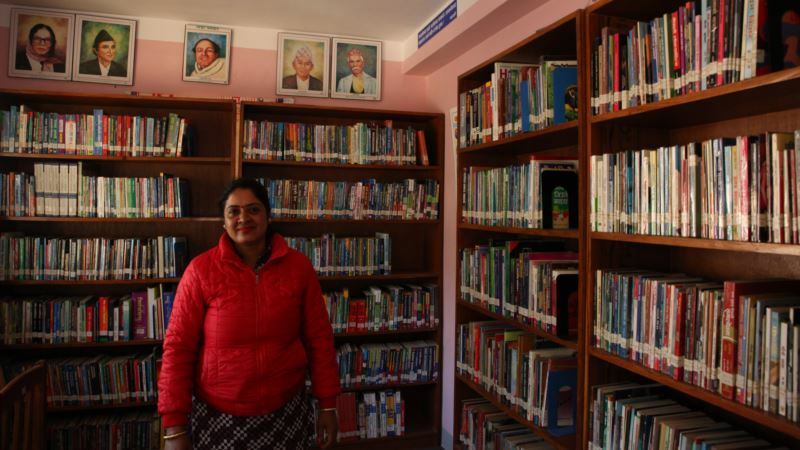 The community library – although a simple idea – has proved hugely popular with the community, said Rakesh Khadka, a project officer with the Practical Answers program in Nepal. Established in 2011, the facility was at first little used, but by 2013 “we were inundated”, he said. Sometimes the library refers tough questions to Kathmandu, where experts can better advise on technical issues. But answers are often found locally, with women sharing solutions among themselves, Khadka said. Little by little, women are becoming more self-sufficient and using the library less often or coming mainly to socialize, he added. Crossing her sandy yard in bare feet, Chini Khadka, 55, pushes back a loose door to reveal a baby calf, closely guarded by its mother. Khadka, who is illiterate and was married at just 9 years old, was happy to show off the cattle that have made her a respected businesswoman in her remote Himalayan village. “After my husband left me, I lived with my mother-in-law, who took pity on me. But she died a few years ago. We had many expenses for my children's studies, so I had to make an income,” she said. She heard about the library and started training with the other women. “Then I got interested in dairy farming because I have very limited land,” she said. Khadka learned to rear cows, build sheds and calculate the correct nutrient requirements for her animals. She now has eight cows, some of which are pregnant, with each fully grown animal worth about $1,000 at market, she said. She also sells milk in town and manure as fertilizer to other farmers. Khadka earns about 30,000 Nepalese rupees ($288) a month. That's more than her son, who works as a teacher, she boasts – and is even enough for her to hire another female farmhand to help tend the vegetables.